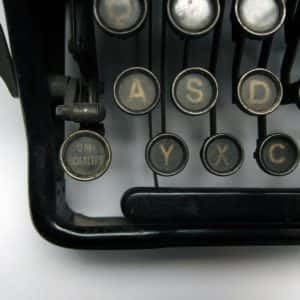 Urania typewriter detail. Image from the Conserve the Sound archive. Conserve the Sound is a digital archive of technical objects which are fast disappearing from daily life. There are crisp photos of the objects from different angles and recordings of the sound that the object makes. Think dial-up modems, old fashioned hair dryers, rotary telephones and more. Obviously, we in the library particularly like the look and sound of the library stamp. This archive might be inspiration for a radio or media project, or for your design portfolio. Background on where the project is based (Germany) and who is funding it is on the Conserve the Sound website.